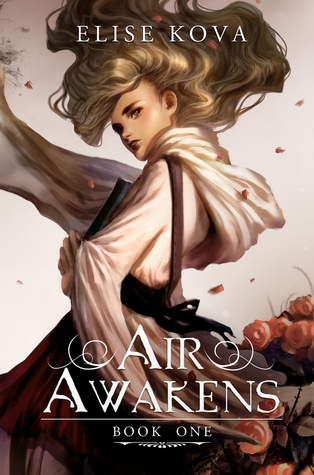 Air Awakens centers on Vhalla Yarl, a young library apprentice who discovers that she's awakened a specific set of powers that allow her entrance into the world of sorcerers. She's grown up believing that sorcerers are meant to be feared, but the more she learns about magic, the history of sorcerers and the sorcerers themselves (including a certain Crown Prince), the more she finds herself enticed by the idea of being a part of their world. In the end, Vhalla has to decide whether or not she wants to be a sorcerer or eradicate her magic and remain as she has always been... before the power lurking in the shadows forces her to make an impossible choice. Plot? I've got to say that the story is fairly typical of the young adult fantasy genre. Girl discovers she has magical abilities - extremely special ones that make her very important to a lot of people - and she must decide what she is to do about it. She's drawn to the comforts of her old life and to the enchantment (pun intended, thank you very much) of her potential new life, and life-threatening events force her to make life-altering choices. Even though I found it predictable in a lot of ways, I still thought it was fun to read. Characters? Vhalla was likable enough as a main character, even though she wouldn't make my list of all-time favorite female leads. I really liked that she was into books and learning through them, and that she reacted to certain scenarios in ways that I felt were similar to how I would have responded to. I did find her thoughts a bit exasperating at times, and her emotions to be a touch too dramatic, she was still interesting to read about. Writing? Here's where my reservations for this story lie, for the most part. I thought the pacing was a little bit off. I also found it to be clunky at times, especially with the dialogue. It was still not very hard to read at all, since I sped through it, but I was definitely very conscious of these two things. Overall? I liked Air Awakens. Even though I thought the story was predictable, I did like the characters (especially Crown Prince Aldrik, who I love) a whole lot and I'm invested enough to want to continue on with the series. As always, Rachel & I will both be answering the same set of questions with every book club pick that we read and review for the Flights of Fantasy Book Club. Don't forget to share your answers with us as well, whether you link up to your post in our monthly link-ups or simply comment below! 1. Who is your favorite character? I think it's fairly obvious that I loved Crown Prince Aldrik. What can I say? I'm into broody, powerful men who are more than meets the eye. 2. Would you read more books by this author? I'm definitely planning to read the rest of the series, so the answer to this question is a yes.